Chief Minister Mamata Banerjee at the foundation day celebration of Trinamool Chhatra Parishad in Kolkata. File/Express Photo by Subham Dutta. Last month, West Bengal witnessed an enormous rally. Leaders from 23 political parties from various states took the stage at Kolkata’s Brigade Parade Grounds, led by Trinamool Congress chief and Chief Minister Mamata Banerjee. It was a show of strength against the BJP-led government at the Centre. On Saturday, Prime Minister Narendra Modi launched the BJP’s Lok Sabha campaign with rallies in West Bengal. He began at Thakurnagar near the Bangladesh border and asked the Trinamool Congress to back the Citizenship (Amendment) Bill, which relaxes citizenship eligibility rules for certain sections including Hindu immigrants from Bangladesh. Why is the BJP repeatedly underlining a focus on West Bengal? West Bengal has traditionally been a Left-leaning state. When BJP president Amit Shah chose Naxalbari, home of the Naxal movement, as the starting point of his nationwide tour in April 2017, Left leaders saw it as a statement by the BJP-RSS combine against Left and extreme-Left ideology. This was the narrative in Tripura too, where the BJP dislodged a 25-year-old Left government last year. And in Bengal, after the Left Front’s ouster, it is Mamata’s Trinamool Congress that is now called the “new Left’’. Its Singur and Nandigram land movements had been styled on Left-styled movements and eventually brought Mamata to power in 2011. Right versus Left aside, the size of West Bengal and the strength of the Trinamool Congress, too, are important. The party is often described as a possible kingmaker in the Lok Sabha elections. West Bengal has 42 seats, behind only Uttar Pradesh (80) and Maharashtra (48), which could determine post-poll government formation. Even in the 2014 elections that were marked by a huge mandate for Narendra Modi, the Trinamool won 34 of these 42 seats, conceding only Darjeeling and Asansol to the BJP. 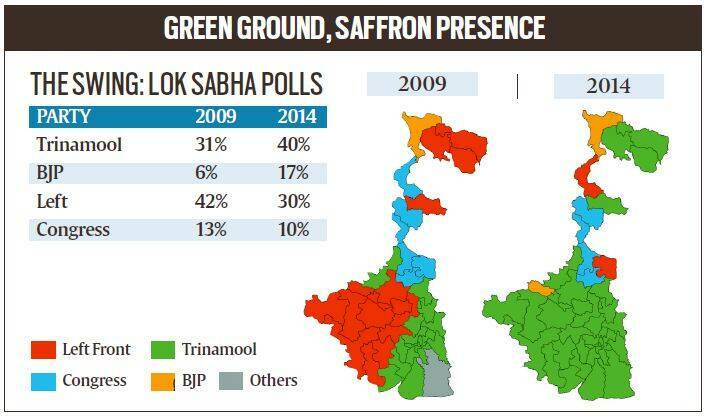 This made the Trinamool the fourth largest party in Lok Sabha. If it does well in 2019, all eyes will be on whether the party would pitch Mamata as a possible prime ministerial candidate in a coalition. So, has the BJP been gaining ground in West Bengal? During its nationwide surge in the 2014 general elections, the BJP captured 17% of West Bengal’s vote, its best performance ever in the state. In the 2016 Assembly polls, the BJP share dropped to 10%, but the party has kept up the pressure. The failure of a Left Front-Congress understanding provided the BJP with an opposition vacuum to occupy. In almost every bypoll since 2016, the BJP has been ahead of the Congress and the Left Front, claiming the role of main opposition. The BJP’s performance relative to the rest of the opposition has encouraged organisations such as the RSS, the VHP and the Bajrang Dal, which had little presence in the state earlier, to become more assertive. By April 2017, the RSS-BJP combine had announced 175 Ram Navami celebrations across districts. Over the next two years, the state witnessed unprecedented “armed processions’’ for Ram Navami. These resulted in the Trinamool Congress taking out its own Ram Navami processions. Both parties later announced celebrations on Hanuman Jayanti, also unprecedented in Bengal. Some of the Ram Navami processions were marked by communal clashes — Hooghly in 2017, Ranigunj and Asansol and Purulia in 2018. There also were other violent clashes, including in Dhulagarh and Uluberia (Howrah) in December-January 2016-17; the BJP eventually displaced the CPM as the main opposition in last year’s Uluberia bypoll. So, is the battle really between the Trinamool and the BJP? That is the way it is being viewed, although both the CPM and the Congress continue to be players. Critics of the Trinamool say the tide is turning against the party after the violent panchayat polls in May 2018, in which the party won 34% of the seats uncontested, amid allegations that it did not allow opposition candidates to contest or voters to vote. Critics say this loss of image will turn Trinamool voters towards the BJP, and that factionalism too will drag the ruling party down. Other observers, however, say it remains to be seen whether the votes gained by the BJP will translate into a significant number of seats, and whether the votes lost by the Trinamool will go mostly to the BJP or will also be shared by the Left Front and Congress. In fact, the BJP too has various power centres, and is already slipping in its existing seats. In Darjeeling, the Trinamool successfully quelled the Gorkhaland agitation, and split the Gorkha Janmukti Morcha between leaders Bimal Gurung (who has gone underground) and Binoy Tamang, who is seen as close to the Trinamool. How well is the BJP placed? Its immediate plank appears to be the Citizenship (Amendment) Bill, hoping that it will attract the votes of Bengali Hindu immigrants from Bangladesh with the prospect of easy citizenship. Before Modi’s Thakurbari rally, Amit Shah had announced that the Bill would be a major poll issue in Bengal. Analysts say it is too early, however, to guess how much traction the Bill will gain in the state. Besides, the BJP is up against a ruling party that will count several factors in its favour. Mamata retains much of her mass appeal, even after the perceived decline in popularity following the panchayat polls. Her political narrative over the last few years has been about targeting the Centre and advocating federalism. Analysts believe that just as Jyoti Basu benefited from a fractured opposition during the Left Front years, so will Banerjee from fractures in the BJP. Long-time observers note that the Left Front had consolidated strongly after its first two terms, with 252 out of 294 Assembly seats; Mamata is now in her second term. And while the Congress enjoys Muslim support in certain districts, the Trinamool Congress is still confident of winning the bulk of this segment (30% of the population) by pitching itself as a counter to the BJP. The party has also consolidated the voter base of the poor, handing out benefits including rice at Rs 2 per kg, and free bicycles for schoolchildren. What about the Congress and CPM? It can be argued that the main reason behind the rise of the BJP has been the decline of the Congress and the Left parties as opposition parties. The Congress decline had begun in 1998 itself, with the arrival of the Trinamool Congress as the main rival of the Left Front. Subsequent alliances between the Trinamool and the Congress, in 2009 and 2011, led to a further erosion in the Congress base. The Muslim-dominated border districts of Murshidabad, Malda and North Dinajpur, however, remain predominantly Congress bastions. About the Left, supporters as well as critics say that the decline has happened primarily because the CPM has been unable to revive itself organisationally and strategically after the Singur and Nandigram agitations. There is also disagreement within the CPM, with leaders in Bengal continuing to oppose the Trinamool Congress and another section of leaders — outside the state — not ruling out an alliance. Both the Congress and the Left Front are organisationally weak, with large numbers of workers having left to join the Trinamool since 2011. On the other hand, many have joined the BJP too. Between them, the Congress and the CPM won six seats in 2014. If the Congress-CPM combine were to retain its seats, and given the strength of the Trinamool, analysts see West Bengal as a difficult state for the BJP to make major inroads into. 2 Matua community — Why are they important for Trinamool and BJP?